Transform your daily cleaning routine with this innovative Japanese-style toilet that combines the functions of a toilet, bidet and shower. Featuring two separate self-cleaning spray heads that you can adjust for position, pressure and temperature, with oscillating and massage spray options and a warm air dryer function, the floor-standing GROHE Sensia Arena makes visiting the toilet a pleasure. It’s full of extra features designed for your personal comfort, including automatic seat and lid opening, powerful flush that cleans and covers the whole bowl, an auto-clean programme and stand-by mode. 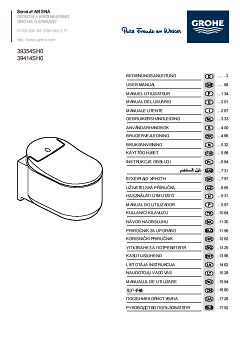 Find your way at night with the toilet’s soft nightlight and warm up with the heated seat function! Designed to be 100% hygienic and easy to clean, the bidet toilet uses Plasmacluster technology and odour absorption to clean the air, while advanced ceramic finishes HyperClean and AquaCeramics are anti-stick, anti-limescale and anti-bacterial, banishing 99.9% of germs. 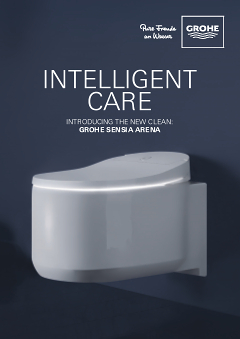 Use the remote control or a smartphone app to control and programme, and let the GROHE Sensia Arena create a whole new level of bathroom luxury and cleanliness. Intelligent technology meets innovative design.